The first time I watched Evangelion I I hated everything about it. Most of all I hated the characters and how slowly the series seemed to move. The disconnect I felt with Shinji and his eternal state of depression did not help either. When I heard that the creators’ were rereleasing the show in a series of movies I had mixed feelings. 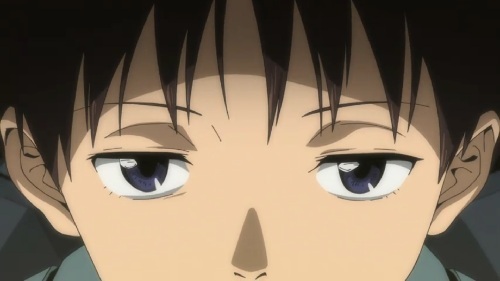 I didn’t want to suffer through another eight hours of Evangelion if it was just a graphics facelift. I still held out hope that instead of just retelling the story, the new version would address the problems of the original series. My hopes were dashed with the first installment, Evangelion 1.0, which seemed almost identical to the TV show. Now that I’ve seen Evangelion 2.0 on the big screen, I can finally say that an enjoyable version of Evangelion has finally arrived. What makes this version of Eva different? Unlike the first movie in this four movie retelling, 2.0 rewrites the plot. The most obvious change is the addition of a new Eva pilot and updated graphics. What is less obvious, and what had a bigger impact on how much I enjoyed the movie, is the new lighter the mood. You get to see Shinji, Rei and Asuka genuinelly enjoy life and spending time with each other. The film isn’t a complete break from the past though, the characters are still depressed, needy, screwed up high school kids much of the time. But if you watched the original and almost had to quit because you were so frustrated with Shinji that you wanted to pull your hair out, then you may find this version easier to swallow. Unfortunately, not every aspect of the film improved on the original. The fan service was my biggest gripe. Fan service does not bother me in general and can even be enjoyable at times. And although I realize that Evangelion pioneered the combination of fan service and 14 year old girls, I still think the fan service here was not in good taste. Tight bikinis may be ok, but skin tight body suits, so tight that it looks like the suits were painted on, is gross. The characters are just too young for that. Is the movie worth seeing at the theater? I think the novelty of seeing an anime on the big screen is reason enough to go. The booming sound system at the theater also beat my lackluster audio setup at home. I didn’t feel great about spending $14 ($10 for the movie, $4 for parking) on a movie I can preorder on Amazon for $12.99. But seeing a version of Evangelion that I actually enjoyed was ultimately worth it. I’ve got to agree with you on the point about fan service. I don’t know if its just a result of time passing and changing expectations because the original series had its fair share of undress and half naked girls who are purportedly 14 years old, but they didn’t seem to be quite so sexualised as they are in this re-make. I’m sure that if I was watching this as a 14 year old I’d be thinking “awesome!” (or probably more likely wondering what the hell these confusing signals were that my brain was putting out) but I’m not 14 years old and a long way from it, and as you say, it begins to make you feel a little uncomfortable to say the least. But glad to see you enjoyed it – looking forward to the next one, I assume? I had the same question about whether my concern about the fan service was just due to time passing. But when I watched the original Eva series again I didn’t the same immediate thought that the fan service was over the edge. So I’m pretty sure that this goes beyond just getting older and more sensitive. I am definitely looking forward to the next one! The creators of Eva have always seemed to have the most flexibility to change the end so I’m confident it will be exciting. Strange, I was introducing Eva 2.0 to a friend yesterday and his discomfort surrounding the fanservice made me realise how desensitised I’ve become to it. As much as I love Evangelion I have to admit that the way it sexualises the likes of Rei and Asuka has always been my least favourite aspect of the franchise. I know it’s a staple of anime to fall back on dirty thrills where plotting and character development fails, but I’ve always felt that Eva didn’t need it. Regardless, the film was a vast improvement over its ‘Eva by the numbers’ predecessor here’s hoping the next two continue the trend. I don’t dislike fanservice as long as there is a reason why it’s there. When Shinji sees Rei naked in her appartment in 1.11, the scene shows the audience she lacks emotions. It is completely opposite of what happens when he sees Asuka naked in 2.22, that scene demonstrates to the audience that Asuka is nothing but emotions. 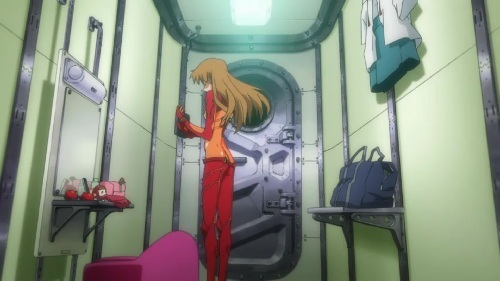 The scene with Asuka in the experimental plugsuit was the only thing about 2.22 I disliked. It was completely unnecessary, and I felt it’s sole purpose was for selling merchandise. Many people sacrificed this series, complaining about the difficulty of relating to Shinji, complaining about his ‘whining’ or whatever. 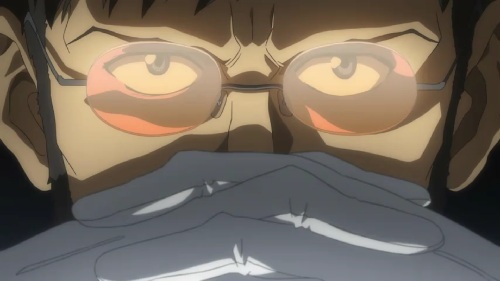 The fact of the matter is Hideako Anno correctly portrayed a socially isolated young man, who is depressed and confused. He correctly portrayed the emotions and feelings of having a lack of self worth. You can’t expect to understand such a persona if you have never suffered in life, really! Such people can never empathise with a character like Shinji. One must also understand Shinji’s part in therefore deciding the fate of humanity. He has always been in a ‘hedgehog’s dilemma’ – unable to be close to anyone yet wishes to love them and be loved. Is humanity worth saving? Should the human instrumentality project allow for all humanity to be merged into pure consciousness, negating all such pain? Or should they be redeemed and should pain be accepted? This is the meaning behind Shinji’s character. NGE is all about humans being unable to love purely and freely. It also doesn’t even begin to touch upon the massive layers of theological symbolism and content, or the expert handling of the other characters in the story. The ‘newer movie’ is lighter, and easier to swallow for a more commercial crowd who can’t ‘get it’. I love EVA no matter what, but wasn’t all too greatly impressed with the ‘fan service’ and the two-dimensional Maki character.